Some buzzing yellow insects make honey. Others make homeowners sweat. 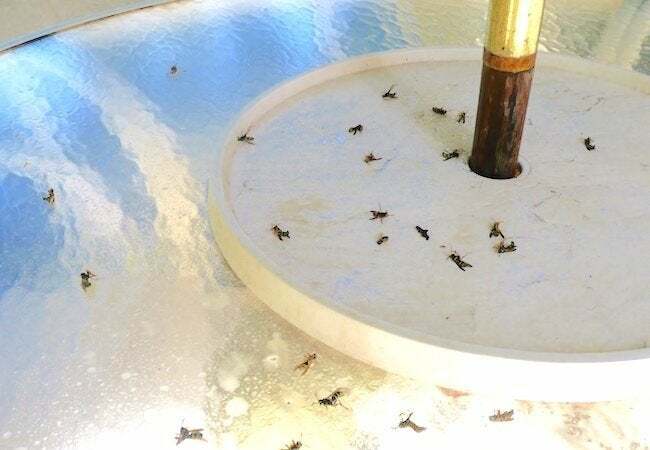 When her lawn and patio became overrun with aggressive yellow jacket wasps, our blogger found a way to fight back, restoring peace to her property with a Black Flag® solution. Under normal circumstances, I would have hated to give up on something I’d so eagerly anticipated. But I have to admit: I could not possibly have been more quick to abort my plans to revive the flower bed in my front yard—all because of some threatening stingers. To be clear, these weren’t sweet little honeybees, buzzing about all day in lazy loops. On the contrary, these were the aggressive, territorial fiends most people call yellow jacket wasps. Up until very recently, I knew them, quite simply, as The Enemy. It was back in early spring that, all at once and quite painfully, I first became aware of The Enemy. Tools in tow, I went out to start preparing the overgrown flower bed that I’d hoped to fill with colorful annuals, transforming it into an oasis in the lawn. I was busily pulling weeds and brushing away mulch when, suddenly, my arm felt as if it had become engulfed in flames. 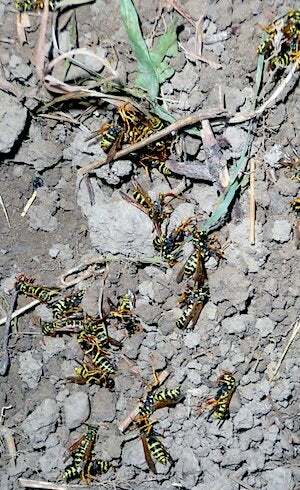 Then I saw a stream of angry yellow jackets pouring out of a hole in the ground. I made a “beeline” back to the house. Through the entire summer, I kept clear of the flower bed, intent on avoiding another barrage of bee stings. I made a few lame attempts to dislodge the wasp’s nest with a long-handled hoe. But in the end, I accepted defeat. The summer season passed, I busied myself with other projects, and that was that. Then I found myself looking forward to next year. Would I cede control of the front yard to the yellow jackets once again? No way. That’s when I decided to pull out all the stops. Determined to reclaim my yard—and yes, take my revenge—I opted to arm myself with Black Flag® Wasp, Hornet & Yellow Jacket Killer. Specially formulated to kill stinging pests not only in the open air but also in their nests, the product relies on two active ingredients. One is prallethrin, an insecticide that, according to the World Health Organization, kills wasps and hornets effectively but does not endanger local wildlife. The second vital ingredient is lambda-cyhalothrin, a chemical that mimics the natural insecticidal properties found in chrysanthemum flowers. I knew that, in combination, the duo would serve my purposes well. Something else I liked: The trigger-activated spray reaches up to 29 feet above the ground, which meant that I could get the job done even while standing at a safe distance from the nest. Applying the Black Flag® treatment couldn’t have been much easier—or more intensely satisfying. First, I gave the easy-to-use aerosol can a vigorous shake. Next, I snapped off the safety tab and, standing away from the nest, took aim. When I was ready, I pulled the trigger and sprayed the nest’s opening, as well as the area immediately surrounding it, to the point of saturation. Because the spray comes out of the can as a thick, white stream, I could easily see where I’d already sprayed and which areas I still needed to treat. 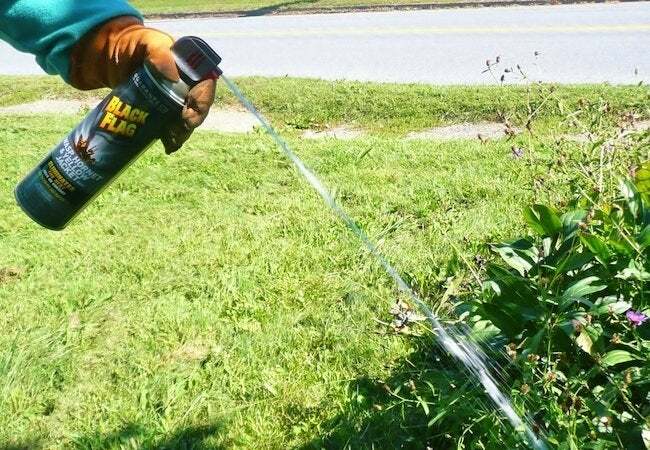 I was worried that the spray would send the yellow jackets into a fit of rage—that, feeling threatened, The Enemy would gang up and make me pay. But as it turned out, my fears were for naught. Most of the wasps never made it out of the nest, let alone off the ground and into flight. As soon as the devils came into contact with the Black Flag® spray, they instantly succumbed. Some expired right away; others, I noticed, spent their final moments on the ground, trying to sting something—anything—and failing. As directed by the instructions on the product label, I waited 24 hours for the dust to settle, then took my rake out to the flower bed to clear the area. The sight of countless dead yellow jackets confirmed that, although The Enemy had won a battle or two along the way, I had won the war. Emboldened by success, I marched into the backyard, where a smaller faction of wasps had made a home within the canvas umbrella that should have been shading our patio table. Needless to say, ever since The Enemy had taken hold here, my husband and I had been favoring other parts of the yard. But now the time had finally come to reclaim what was ours. Slowly, carefully, I raised the umbrella high enough to glimpse a mass of yellow jackets inside the top of the umbrella’s canopy. Quickly, I reached for the Black Flag® Wasp, Hornet & Yellow Jacket Killer, took aim, and sprayed. My instincts guided me to back away even while spraying the treatment, but there was no need to retreat. 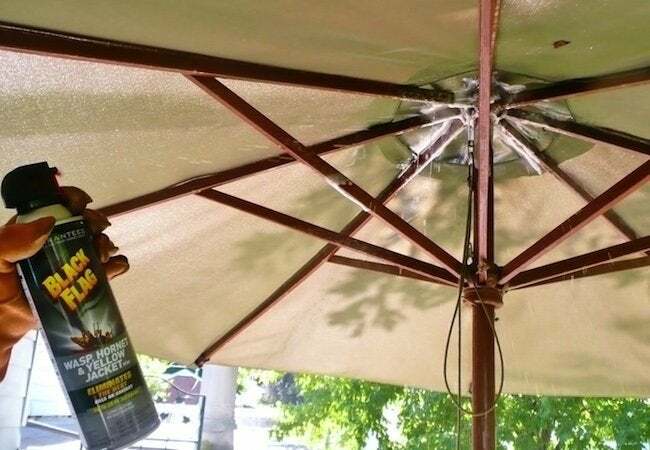 The wasps literally dropped right onto the table beneath the umbrella, one after another, gradually turning the glass surface into a graveyard for The Enemy. I waited around just long enough to see that as more yellow jackets returned to their umbrella hideout, they, too, fell to the patio table, dead or dying. Nights later, after having washed and rinsed the umbrella and table, my husband and I enjoyed dinner on the patio for the first time in ages. Our yard finally feels like it’s ours again. My only regret is having waited so long to fight back. Considering how easy it was to vanquish The Enemy, we should have taken care of this at the start of the summer. The silver lining is that I now know precisely what to do if yellow jackets ever return to our neck of the woods. It feels good to be back in control! This is a sponsored post written by me on behalf of Black Flag® Insecticides. The opinions and text are all mine.